SUBHEAD: Evidence of the continuing health risks of Fukushima Daiichi radiation to Japan's children. 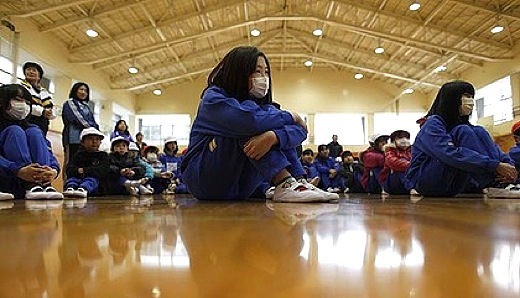 Image above: With their faces covered by masks, these children are restricted to indoor activities at Fukushima city's youth center gymnasium. From (http://www.smh.com.au/world/invisible-threat-hangs-over-people-of-fukushima-20120310-1ur56.html). The cause substance have been found. This is an aggregate of radionuclides which starts with Uranium. It was made in the blast furnace of a nuclear reactor at more than 5000°C. This mixed metal contains four different substances, α・β・γ and also have the possibility to radiate neutron ray. No creature on earth never knew this substance. We are forced to have those strong substances inside our body without knowing where it exactly stays. To say that "Cesium has got the same system as potassium and it will be discharged from the body" is just a lie! The body can't recognize 5% of cesium and other complex substances (mixed metal) so i doubt that our body could badly react. And this fact can open the closed door of global fallout of nuclear experiences in the 60's and also the hidden history of hot particles contamination of the world. It also shows the wrong way used by leaders and their methods about the fact of death ash after Hisroshima and Nagasaki. The conclusion is that anyone who doesn't show the facts about the substance of cause is our enemy. We are all manipulated by the words "radiation" and "radiation doze" without knowing the real identity of radiation source. We are not told the real facts of being irradiated and they force us to believe that it's just pure metal and they let us believe in "behavior and extracorporeal elimination" and force us to believe in the myth of security. On top of all that, they only compare radiation doze and natural potassium contained in bananas and manipulated people as if it was a scientific study. I really want the scholars patronized by the government to be punished by the rancorous of all children on this earth. The usual practice of misleading people is to create setters and contractors in many layers. They let people believe that they are normal person and people who listen to them start to believe them. They are making fans and they lead people distinctly as a result. They are always avoiding the issue. The issue is hold in the hands of enemies and when people know the issue, the energy makes a conciliatory move and took them to neutralize the attack of public opinions. The guilt of global fallout is the corruption of concession groups of the nuclear industry and medical and insurance companies. They made cancer to increase in a dramatic way and Japan as a nation that was victim of atomic bombs in the world which have medical history of contamination but they don't let us know the substances of death ash in Hiroshima and Nagasaki. And there's more. They were manipulating us from the beginning of the accident by telling us that "95% of the contamination comes from food, 4% from water, only 1 % from aspiration". An adult person aspirates 20m3 of air per day and in weight it's 20kg. We take food and water much less than that. The lung takes varied chemical substances as it takes oxygen from air. The hot particle size is all １μm. It's really small so it goes into the blood and into the body. Then the organs take them . The size of mesh hole of the filter to incinerate debris is also １μm. The informations say that hot particles were diffused and flied in all directions in Japan. The particles from hell is flying in the air and people don't protect themselves anymore three years after the nuclear accident and children are aspirating those horrible particles everyday!!! Please let all people in the world to know the life we are living since the accident, everyday and today. Spreading the radioactive debris and decontamination that doesn't work is only increasing the number of HIBAKUSHAS without good reason. Yoshida, N. & Kanda, J. Tracking the Fukushima radionuclides. Science 336, 1115–1116(2012). MEXT: Japanese Ministry of Education, Culture, Sports, Science and Technology,http://www.mext.go.jp/english, accessed on May, 07, 2013. Masson, O. et al. Tracking of airborne radionuclides from the damaged Fukushima Dai-ichi nuclear reactors by European networks. Environ Sci. Technol. 45, 7670–7677 (2011). Takemura, T. et al. A numerical simulation of global transport of atmospheric particles emitted from the Fukushima Daiichi Nuclear Power Plant. Sola 7, 101–104 (2011). Achim, P. et al. Analysis of radionuclide releases from Fukushima Dai-Ichi Nuclear Power Plant accident Part II. Pure Appl. Geophys. 10.1007/s00024-012-0578-1 (2012). Stohl, A. et al. Xenon-133 and caesium-137 releases into the atmosphere from the Fukushima Dai-ichi nuclear power plant: determination of the source term, atmospheric dispersion, and deposition. Atmos. Chem. Phys. 12, 2313–2343 (2012). Christoudias, T. & Lelieveld, J. Modelling the global atmospheric transport and deposition of radionuclides from the Fukushima Dai-ichi nuclear accident. Atmos. Chem. Phys. 13,1425–1438 (2013). Chino, M. et al. Preliminary estimation of release amounts of 131I and 137Cs accidentally discharged from the Fukushima Daiichi nuclear power plant into the atmosphere. J. Nucl. Sci. Technol. 48, 1129–1134 (2011). Katata, G., Ota, M., Terada, H., Chino, M. & Nagai, H. Atmospheric discharge and dispersion of radionuclides during the Fukushima Dai-ichi Nuclear Power Plant accident. Part I: Source term estimation and local-scale atmospheric dispersion in early phase of the accident. J. Environ Radioactivity 109, 103–113 (2011). Winiarek, V., Bocquet, M., Saunier, O. & Mathieu, A. Estimation of errors in the inverse modeling of accidental release of atmospheric pollutant: Application to the reconstruction of the cesium-137 and iodine-131 source terms from the Fukushima Daiichi power plant. J. Geophys. Res. 117, D05122, doi: 10.1029/2011JD016932 (2012). Burns, P. C., Ewing, R. C. & Navrotsky, A. nuclear fuel in a reactor accident. Science 335,1184–1188 (2012). Morino, Y., Ohara, T. & Nishizawa, M. Atmospheric behavior, deposition, and budget of radioactive materials from the Fukushima Daiichi nuclear power plant in March 2011.Geophys. Res. Lett. 38, GL048689 (2011). Yasunari, T. J. et al. Cesium-137 deposition and contamination of Japanese soils due to the Fukushima nuclear accident. Proc. Natl. Acad. Sci. USA 108, 19447–19448 (2011). Kinoshita, N. et al. Assessment of individual radionuclide distributions from the Fukushima nuclear accident covering central-east Japan. Proc. Natl. Acad. Sci. USA 108, 19526–19529(2011). Doi, T. et al. Anthropogenic radionuclides in the atmosphere observed at Tsukuba: characteristics of the radionuclides derived from Fukushima. J. Environ Radioactivity 122,55–62 (2013). Kaneyasu, N., Ohashi, H., Suzuki, F., Okuda, T. & Ikemori, F. Sulfate aerosol as a potential transport medium of radiocesium from the Fukushima nuclear accident. Environ. Sci. Technol.46, 5720–5726 (2012). Damle, A. S., Ensor, D. S. & Ranade, M. B. Coal combustion aerosol formation mechanisms: A review. Aerosol Sci. Technol. 1, 119–133(1981). Kajino, M. et al. Development of the RAQM2 aerosol chemical transport model and prediction of the Northeast Asian aerosol mass, size, chemistry, and mixing type. Atmos. Chem. Phys.12, 11833–11856 (2012). Saito, K. et al. Nonhydrostatic atmospheric models and operational development at JMA. J. Meteorol. Soc. Jpn. 85B, 271–304 (2007). The real facts about the danger of ionizing radiation have been dismissed and hidden by the medical establishment, the nuclear industry, and the military industrial complex for countless years (discussed in "The Mammogram Myth" by Rolf Hefti - more at http://www.supplements-and-health.com/mammograms.html ). The lies about radiation toxicity continue because any admission of the truth inculpates massive corporate industries.